Readers may know that UNESCO, the United Nations Educational, Scientific and Cultural Organization, maintains a "World Heritage list," that is, a list of cultural and natural sites that the World Heritage Committee considers to have outstanding universal value. (Earlier mention here.) As of June 2013 the list includes 981 properties in 160 nations. Italy is well-represented, and within Italy, the Campania region is well-represented. This is a list of those sites that are either in the Campania region or close enough to be accessible. A couple are farther away, but I include them because I like them and have mentioned them somewhere in these pages. Note that many of the so-called "sites" are not single buildings or even a complex of buildings; they are entire areas. I have provided appropriate links where available. Also, there are a number of worthwhile sites in and around Naples that are not on the UNESCO list—other sites of Magna Grecia such as Cuma, for example and Pithecusa (Ischia), but we take what we can get. 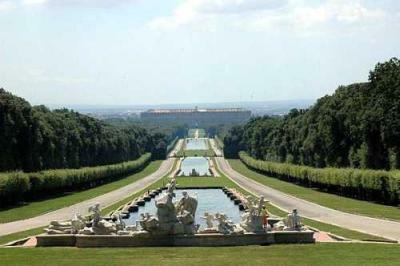 The monumental complex at Caserta, created by the Bourbon king Charles III in the mid-18th century to rival Versailles and the Royal Palace in Madrid...brings together a magnificent palace with its park and gardens, as well as natural woodland, hunting lodges and a silk factory. It is an eloquent expression of the Enlightenment in material form, integrated into, rather than imposed on, its natural setting. 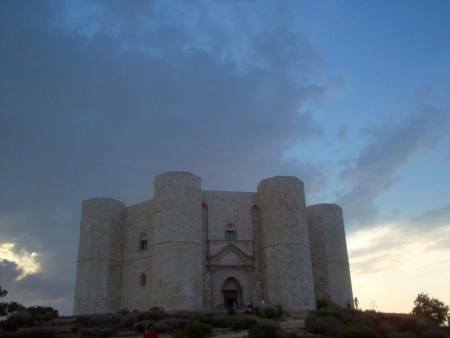 When the Emperor Frederick II built this castle near Bari in the 13th century, he imbued it with symbolic significance, as reflected in the location, the mathematical and astronomical precision of the layout and the perfectly regular shape. A unique piece of medieval military architecture...it is a successful blend of elements from classical antiquity, the Islamic Orient and north European Cistercian Gothic. During the late 2nd millennium B.C. 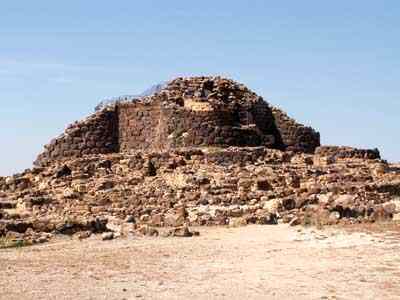 in the Bronze Age, a special type of defensive structure...developed on Sardinia...circular defensive towers in the form of truncated cones built of dressed stone, with corbel-vaulted internal chambers. 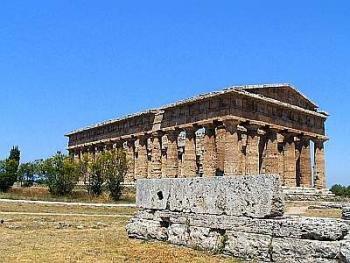 The complex at Barumini...extended and reinforced in the first half of the 1st millennium under Carthaginian pressure, is the finest and most complete example of this remarkable form of prehistoric architecture." ...that testify to the high achievement of the Lombards, who migrated from northern Europe and developed their own specific culture in Italy where they ruled over vast territories in the 6th to 8th centuries. The Lombards synthesis of architectural styles marked the transition from Antiquity to the European Middle Ages, drawing on the heritage of Ancient Rome, Christian spirituality, Byzantine influence and Germanic northern Europe. The serial property testifies to the Lombards' major role in the spiritual and cultural development of Medieval European Christianity, notably by bolstering the monastic movement. See link to Lombards in next item, below. —SANCTUARY OF SAN MICHELE (bottom photo, right) in the town of Monte Sant'Angelo. The town is at 831 meters/2500 feet and is the highest town on the spur. 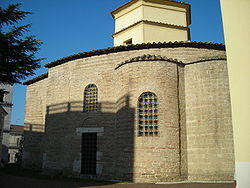 It is also the site of the oldest sanctuary in western Europe dedicated to the Archangel Michael. It was one of the important sites of early Christianity. For good measure, Mt. Etna on Sicily, just made the list! 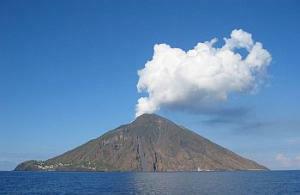 Still a very active volcano. (4) the Mediterranean diet (a heritage shared with Spain, Greece and Morocco). In Campania there is indeed a place where the Mediterranean diet has been studied quite thoroughly (see this link). I don't know why that surprised me; maybe it's because I've noticed an increase in the number of fast-food places. Yet, who knows...that, too, may be Mediterranean! —Gubbio and the Festival of the Candles. (6) from the island of Pantelleria, south of Sicily, the traditional practice of cultivating head-trained bush vines (vite ad alberello). The technique consists of levelling the soil and digging a hollow to plant the vine. The main stem of the vine is then carefully pruned to produce six branches, forming a bush with a radial arrangement. The hollow is constantly reshaped to ensure the plant is growing in the right microclimate. The wine grapes are then harvested by hand during a ritual event starting at the end of July. Proposals for inclusions on the Intangible Heritage List for Italy for 2015 and 2016 include the traditional Neapolitan Pizza. Update directly below.....drumroll...! The art of the Neapolitan ‘Pizzaiuolo’ is a culinary practice comprising four different phases relating to the preparation of the dough and its baking in a wood-fired oven, involving a rotatory movement by the baker... etc. See this miscellany link. —also maintains an Underwater Cultural Heritage program. See this link. UNESCO established the Memory of the World Program in 1992. Impetus came originally from a growing awareness of the precarious state of preservation of, and access to, documentary heritage in various parts of the world. War and social upheaval, as well as severe lack of resources, have worsened problems which have existed for centuries. Significant collections worldwide have suffered a variety of fates. Looting and dispersal, illegal trading, destruction, inadequate housing and funding have all played a part. Much is vanished forever; much is endangered. Happily, missing documentary heritage is sometimes rediscovered. - the Newsreels and photographs of Istituto Nazionale L.U.C.E. (the corporation in Fascist Italy that produced newsreels and documentaries. Clever name: Luce means "light" but was an acronym for L'unione cinematografica educativa... The Collection constitutes an inimitable documentary corpus for understanding the formation process of totalitarian regimes...but also well beyond the areas occupied by Italy during fascism, especially as regards the period of the Second World War) and about mass society in the 1920s and 1930s. And so forth. I don't think the Constitution of Melfi is on the list yet, but it should be. Here's why. Among various publications that accompany the general presentation of the program is a UNESCO document entitled LOST MEMORY - LIBRARIES AND ARCHIVES DESTROYED IN THE TWENTIETH CENTURY. In Italy, Naples was among the victims when retreating German forces set fire to the university library in 1943 and destroyed around 200,000 volumes. The graphic shows that this is truly a UNESCO "transnational World Heritage Site." It involves the participation of 12 countries (now including Italy) in Europe. The original Primeval Beech Forests of the Carpathians project was just what it said, a project to protect the beech forests in the Carpathian mountains of northern and central Europe. Then it just spread out. The plant species under discussion is the Fagus sylvatica, (also the European beech or common beech) is a deciduous tree belonging to the beech family Fagaceae. Fagus sylvatica is a large tree, capable of reaching heights of up to 50 m (160 ft) tall and 3 m (9.8 ft) trunk diameter. ...are undisturbed, complex temperate forests, exhibiting the most complete and comprehensive ecological patterns and processes of pure and mixed stands of European Beech across a variety of environmental conditions, such as climatic and geological conditions ...[and]...represent an outstanding example of the re-colonization and development of terrestrial ecosystems and communities after the last ice age... The dominance by Beech across extensive areas of Europe is testament to the tree’s genetic adaptability. - Pollino National Park. The park straddles the regions of Basilicata and Calabria. It is Italy's largest national park. - The Gargano National Park, in the province of Foggia. Aside from the Mount Gargano promontory from which it takes its name, the park also includes the Tremiti Islands archipelago and the Foresta Umbra, a large protected area.